Let impassioned Italian design steal your heart. Leave it to Italy's finest craftsmen to make you fall in love with furniture. This premium-quality wine credenza is hand-made from tulip and walnut hardwoods, then hand-stained in rich walnut with patina applications. Accented with solid brass hardware. Our Siena Mezzo Wine Credenza is designed to fit two of our 28-Bottle Touchscreen Wine Refrigerators** (both included). Each of the two compartments are sized to hold our 28 Bottle Touchscreen Wine Refrigerator while allowing for proper ventilation. Simply place each one in the credenza, remove the back panel and start storing your wine properly today. Buy the complete set and own the ultimate service center! The Siena Mezzo (mezzo meaning "half" in Italian) is roughly half the size of our original Siena Wine Credenza. **Important Note: When installing the 28 bottle units into your credenza, you will need to remove the back panel. This easy process requires removing the screws from the back of the unit. Weight: Credenza - 227 lbs. ; Wine Refrigerator - 72 lbs. *Note: Shelving is meant to hold standard 750 mL size bottles, using larger Pinot Noir/Rhone size bottles may limit the capacity. If you would like to store larger bottles you can easily remove any of the shelves. This will also prevent scraping the labels on the larger bottles. Mon, Apr 29 - Fri, May 10. We can have on cooler for wine and another for beverages? BEST ANSWER: There are two seperate compartments. 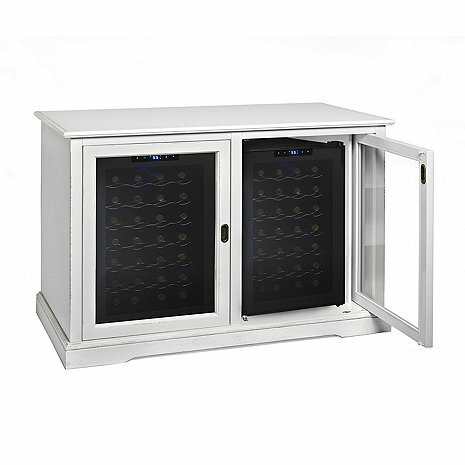 See if you can order a wine cooler and a beverage center that would be the correct size.